Cell cycle and cell proliferation are tightly controlled cellular processes, and their deregulation is a hallmark of cancer. 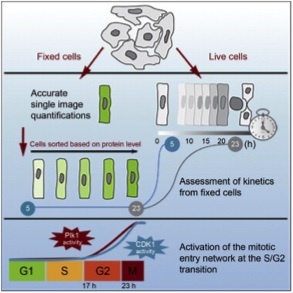 To enable non-invasive analysis of cell cycle in living cells, ChromoTek developed a Cell Cycle Chromobody. The Cell Cycle Chromobody (CCC) consists of a binding domain of a heavy-chain antibody highly specific against human proliferating cell nuclear antigen (PCNA), which is genetically fused to a fluorescent protein. Chromobody® plasmids: Good things come to those who wait! ChromoTek GmbH (Munich, Germany) has announced today the signing of a license agreement granting Bayer Pharma AG (Bayer) the right to use ChromoTek's proprietary Cell Cycle Chromobody® Technology for drug profiling by High Content Analysis. Under the terms of the agreement, Bayer will apply Chromobody® technology for real time monitoring of cell cycle progression in drug discovery. Financial terms of the agreement were not disclosed. This agreement follows a collaboration in which ChromoTek provided custom cell line development. ChromoTek's Chromobody® Technology is a patented, universal live cell imaging technology for high content analysis. Chromobodies are single domain antibodies that have been genetically fused to fluorescent proteins to serve as functional nanoprobes in living cells. The Chromobody® technology allows for the first time to trace endogenous intracellular antigens and to visualize dynamic changes of these targets within living cells. Currently available Chromobodies trace important cellular processes like cell cycle, apoptosis, DNA damage and repair or allow cytoskeletal analysis. The Cell Cycle Chromobody® cell line licensed by Bayer traces the complete cell cycle in real time in live cells in a non-invasive manner while providing full flexibility to multiplex with other procedures. Dr. Kourosh Zolghadr, Head of R&D at ChromoTek comments: "We are pleased to offer our customers efficient tools for achieving more detailed and physiologically relevant information on the effects of drug candidates on cell cycle progression." ChromoTek products set new benchmarks for cellular research. Established in 2008 as a spin-off from Munich’s Ludwig Maximilian University and located in Martinsried, Germany’s leading biotech cluster, ChromoTek develops and markets Chromobody® based live cell assays for drug screening and target validation. Other products include immunological and bioimaging reagents such as the GFP- Trap® for the rapid pull-down of GFP fusion proteins, GFP and RFP-Booster to amplify fluorescence signals of GFP or RFP fusion proteins. ChromoTek’s newly developed fluorescence based protein protein interaction assay called Fluorescent-2-Hybrid (F2H® assay) is available as a development service. More than 2.800 customers from all over the world trust in ChromoTek products.